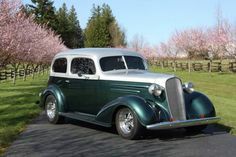 This is an outstanding 1934 Chevrolet Sedan that has had a top-notch restoration with no expenses spared. Careful and close attention to every single detail makes this 34 Chevy clean, smooth and crisp. You would be hard pressed to find a nicer vehicle than this one.The body is all steel with fiberglass fenders and running boards. The running boards have been molded into the front fenders. Exterior modifications include a tilted back grill, smooth hood sides ( Rootleib Hood), smooth cowl, filled roof, a relocated gas filler, and shaved door handles. Another feature is a flush mount LED taillight bar.Exterior is yellow and it is in excellent show condition. The Mint Green leather interior makes for a nice color combination. The interior is flawless.Engine is a 406 cid paired with a 400 Turbo automatic transmission. The engine block, heads, and intake have been ground smooth and painted tan. The firewall has also been smoothed. Radiator is a Walker radiator.Other features are 4-wheel disc brakes, 4-wheel independent air ride suspension, Dan Fink hinges, Ron Francis harness, Ididit polished steering column and linkage, LED shift indicator and turn signals with display in rear mirror, Vintage AC and heat, power windows including the wing windows, Mustang II front suspension, 20 x 10 and 18 x 8 Billet Aluminum Colorado Custom Wheels.This 1934 Chevrolet Sedan is runs and drives with excellent performance. It is dependable and runs cool. Several trouble-free trips have been made in this custom Chevrolet Sedan.Car is located in KY and available for viewing by appointment.